I'm still unpacking a box now and then, but I can see light at the end of that tunnel. So yesterday I took a field trip downtown. I made a stop at a quilt shop there called Crimson Tate. They specialize in bright fabrics so I bought some Amy Butler and Tula Pink and a couple other pieces for an upcoming project. I could have bought another $20 worth of fabric, but instead I'm going to have to use it to pay this parking violation. Sure I only put 15 minutes on the meter, but I was just going to run in the shop and buy a few pieces of fabric. I should have known better. The parking meters downtown look like this. I very seldom go downtown, so this little sign on a stick was new to me. I can't tell you how many great parking spaces I passed up before I finally pulled into one of them and read the instructions. 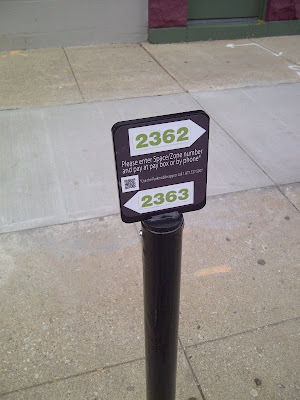 I thought this space was reserved for number 2362 so I kept circling. It turns out you either call a phone number or install an app on your phone where you enter your credit card info and email address. I installed the app and then I put the green number on the sign into the appropriate space and entered how much time I was going to put on the "meter". It supposedly sends a tone to your phone when your time is up and you need to add more minutes. I guess I was too busy looking at fabric to hear that sound. I didn't notice the ticket in the bright, yellow envelope until I was going about 70 down the interstate and saw something flapping in the breeze. It was fastened under my windshield wiper, and luckily it made it home with me. Otherwise the fine doubles if not paid in 7 days. I can't figure out how someone knows when my time is up by looking at this, but trust me.....somehow they found out. I've been doing a little more unpacking. I found some things that are finished or are nearly finished. This first quilt called A Distant Star was published in the Dear Hannah book by Brenda Papadakis. I'm on page 35! Here's a Halloween quilt that is almost finished. I just need to do a little more quilting in the border and add the binding. Here's a close up of the center. The pattern is from Sentimental Stitches. I did echo quilting around the redwork center and the pinwheel blocks are quilted in a curvy straight line. I set my Bernina to stitch number 4 (a zig zag), and my stitch width to 4 and stitch length 3.5. That sews a soft curve instead of doing a stitch in the ditch quilting line. Here's a table runner from a class I took years and years ago. The strips are woven with fabric that we sewed into tubes and then pressed. I think it is too long to be a table runner, but I have no idea how to take it apart to make it smaller. So I did a basting stitch around the edges. I should add a border, but the runner is thick so don't know whether to put some batting or flannel in the border. This is a UFO that I'm not sure really how to finish. I may just add a binding and call it finished. This is one of Carol Doak's patterns. It is from the book Easy Stash Quilts. As I was folding it, I noticed this nick in the binding so I put it in the UFO category. You can see it in the photo above at the bottom almost in the center. Here is a closer look. That fabric is old, and I don't have any more of it. So I will probably take this binding off and use another fabric. Then that one will be finished. I hope you have some time to take a few stitches today. Hello Everyone I've unpacked another box and wanted to show you what I've found. Here are part of my Elegant Garden patterns by Edyta Sitar with some fabric in a bag. The rest of the patterns and this one block were in a notebook. I should really finish this quilt because I like the one block that I finished. Maybe I will do just one block each month. I think this was a block of the month. I have all of the appliqued block kits for Old Voices New Impressions by Jeana Kimball. What you see in the photo is about as much as I have finished. These are all of my printed Sally Post blocks. These can be found at Sentimental Stitches I have all of the patterns and the fabric in this bag. I haven't started this project yet. Gay has a lot of great things over on her web site! Here is another plan. Antique Sampler by Sue Daley. I have my focus fabric and background in a bag with the pattern. Nothing started here either. Another box unpacked. I'm getting closer to the end. I've stopped in between unpacking to sew a little. I'll show you that in another post. Hope you are finding some time to stitch this weekend. This quilt is from a round robin I was in about 3 or 4 years ago. I love the bright, happy colors of this quilt. The girls in this group really did a great job, especially Nancy Z. making all of those hexagons and leaves for the outside border. They are all sewn on by hand. This red work Santa is from an old McCalls magazine. It will be a small quilt/wall hanging size. I'm not sure if you can see it in this photo, but I have started to hand quilt it. I really need to smooth this one out but can't take it completely apart to iron it unless I take the quilting out.....I don't think I want to do that. This is my Jane Austen quilt. It was a lot of fun cutting these diamonds, but this quilt top was finished before my English Paper Piecing days. You can kind of see those bias edges waving at you from where you're sitting. I could take that green border off, but I think this one has more problems than just the border. There are 4 diamonds of the same fabric placed equal distance from the center. Remember watercolor quilts? I made this quilt top when that was all the rage. This was made before I'd ever heard of the 1" fusible grid that is available on the market now. This one was pieced together one square at a time. This two color applique' pattern called Sunflower Fields is available from Pacific Rim Quilt Company. I have 3 more of their two color applique' patterns in the works to do plus another one that is Halloween. The hand applique' is all finished on this one; it just needs quilting. Here is another round robin. One of my friends thought it was a little boring, so she put a bright pink flange and corners on her round. I found a batik that is pretty similar so sometime I might add some to the quilt. I was never quite sure what to do with this one. That's it for this box. It's kind of fun taking this part of unpacking slowly so that I can take a good look at the things I haven't seen for several months. I hope that you are finding a little time to stitch today. Hello Everyone I hope you are enjoying a nice weekend. Here is my newest 2" six pointed star. It is made from the same fabric shown in my post here except that this star is in a different color way. The fabric is Carrie's Madders C1870 by Carrie Quinn for Blue Hill Fabrics. When I went to English Paper Piecing Addiction Group last Monday, I sat by Michelle. She always has something new and interesting to share with the group. She was teasing me because I almost had to empty my container of star pieces to find the last point to sew on my stars shown in my last post here. In a few days I received this package in the mail from Michelle. The star shown above is from the fabric that she sent me. The paper clips and binder clips that are in the box are for me to get organized. (Several have tried before!) Below left is the container of star pieces that I had at our group get together. So you can see why Michelle sent the package. The right container is my Lucy Boston Patchwork of the Crosses pieces. And, below is my star container with all of the star pieces organized and clipped together ready for sewing. Thanks Michelle. The clips really do help. Now I'm going to work on the Lucy Boston Patchwork of the Crosses pieces, and then I'm going to sort my Road 66 hexagons. Here are all three of my stars made from the Carrie's Madders fabric. The three fabrics are identical; the template was just placed on each one differently. Today I took a packing break to have a little fun. I went to the monthly meeting of our English Paper Piecing Addiction group that meets the second Monday of every month at Back Door Quilts. These quilts belong to the shop. Their samples are just gorgeous, and I came home really inspired to pull out some fabric and get busy. Michelle's Mom brought this quilt for show and tell. She also worked on these dimensional wool applique blocks. You can see Michelle's box of paper pieced blocks. Somehow I was having so much fun that I forgot to take photos. This Christmas table runner was made by one of the girls at Back Door. The last few days I've been working on baby quilts to donate to charity. My Bernina stripped her gears, so it is in the shop until next Monday afternoon. I've been piecing on my trusty Featherweight and will machine quilt these next week. I made these two stars while I was at EPP Addiction this morning. I've taken photos of the selvages so you can see the fabric I've used. That's all for now. I'm off to another sewing group tomorrow. Here is the next box, and sadly there are no unfinished quilts.....all UFOs. This first one is Shakeskpeare in the Park. It is in The Creative Pattern Book by Judy Martin. I made this one for my son and daughter-in-law's wedding.....I'm embarrassed to tell you that it's older than a decade. In this photo, the colors look more realistic. This is Tiki my quilting assistant. Here is another of the Northcott flower of the month table toppers. I believe this one is the same pattern as you saw in the last post except that I've used Christmas fabrics. I participated in an Amish block swap many years ago at a Dear Jane retreat in Shipshewana, Indiana. These are my blocks from that swap. This quilt is made up of second Saturday blocks. This is one of those deals where you buy the first block for $5 and if you can get that block done and take it back to the store before the sun rises (or thereabouts) on the first Saturday of the next month, that block kit is free. If you don't get there in time, then you can get the next month's block kit for $5. There are extra blocks available for sale (of course). I remember my friend, Pam, and I meeting at the store and buying these blocks. I drew this Valentine String Heart quilt in EQ5 and posted it in a Valentine's post here. These are string blocks. There are 48 blocks total: 40 blocks that are half red and half white; 2 blocks that are all white/background; 6 blocks that are all red. The blocks in this quilt are 8" finished. That's all I found in this box. I am going to have to come up with a plan to finish some of these quilts. I've done a little more unpacking. I've saved the quilt and yarn boxes for last for the most part. This quilt is from Edyta Sitar's book Friendship Strips and Scraps. This is a top that needs quilting. I spray basted these two Halloween panels awhile before I packed them in the box. I'm not sure where I was going with either of them, but I found them in Tennessee on vacation. So more UFOs. This table topper is finished. This one and the one below were a series by Northcott called Flower of the Month. Each month there was a pattern and fabric that was appropriate for the season. If I find more of these, I think they will all be made from either the pattern above or below. I sort of liked the star below (and it was easy), so I think I just mainly used that pattern. I quilted both of these on my home machine. And a blue churn dash table runner. This one has been around awhile because I don't normally do things that are so much of one color. I think this one is going to be a gift. That's the end of this box. Even though I made a detailed list of what I packed, some of the names in my journal don't ring a bell. I've found some surprises that I forgot about. It's beginning to look like I need a plan to finish some of these UFOs. This is the first box of quilts that I've opened. It has a couple of UFOs and some finished quilts. The first one I found is Peppermint Twist from Remembrances by Jo Morton. I love this little quilt. I hope to hand quilt it. This quilt is from a round robin I was in a few years ago. I did the center block from an Edyta Sitar pattern in the book Hop to It. This one and the one above were spray basted and then after a time folded and packed away in a box. They are going to have to be taken apart and pressed to get the wrinkles out. These three are finished table toppers for Valentines. The top one is made from small string blocks. The link to my heart strings tutorial can be found here. The bottom left is a red work heart that should have been set on point in another quilt. I re-purposed it into this quilt as you go table topper found here at Sew We Quilt. I used the same technique in my Halloween Dresden Table Topper linked below. The bottom right is made from half square triangles. That post can be found in my post Heart Strings Alternative here. The Halloween quilt as you go topper below top left is made in the same way as the redwork heart quilt as you go table topper above. The tutorial for the Halloween Dresden Table Topper is in my post here. It was part of the Wicked Blog Hop over at Sew We Quilt a couple of years ago. The bottom right is a little table topper from 1" finished half square triangles. The bottom right table topper is made from my tutorial: Turning Squares into an On Point Quilt tutorial found here. The flags are from the Little Quilts All Through the House book. The flying geese table topper is just something I made. My tutorial is here. I have also linked to all of these tutorials on my side bar. The table runner below is from an old leaflet that I no longer have. If anyone recognizes the pattern, let me know. 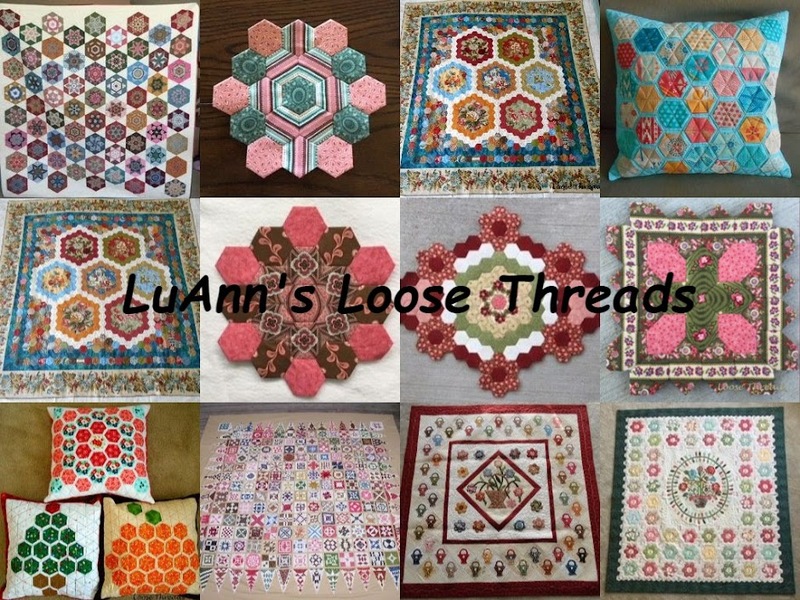 The little tumblers are from a give away that I won on Kathy's blog (Inspired by Antique Quilts). The other little quilt is from a quilt along by Lori at Humble Quilts blog. I hope you are enjoying a nice weekend and taking some time to stitch.